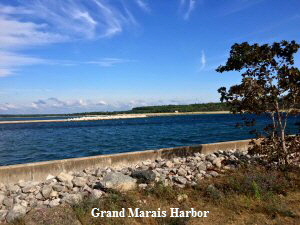 Grand Marais is located on M-77, 25 miles north of Seney in Alger County. 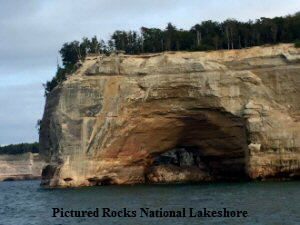 It is the eastern gateway to the Pictured Rocks National Lakeshore. This unique village is nestled amoung the trees on the sparkling shore of Lake Superior. Au Sable Light Station, Highway 28 to Highway 77, Grand Marais, MI 49839. 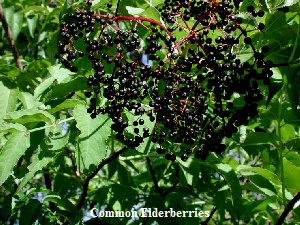 Phone: (906) 387-3700. The AuSable Light Station is listed on the national register of historic places. Built in 1874 to warn mariners of a dangerous reef off of the AuSable Point. Now automated, the light station is being restored to its 1910 appearance. 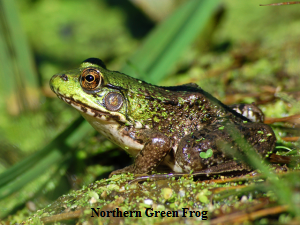 Guided tours are offered July and Aug., the grounds are always open, access is limited by snow from Nov.- April. Gitche Gumee Agate and History Museum, E21739 Brazel Street, PO Box 308, Grand Marais, MI 49839, Phone: (906) 494-2590. A small, profound and very different museum with a diverse mineral display of lumbering and commercial fishing items, a wide variety of Lake Superior agates and a worth-visiting gift show that has agate products and other unique items for sale. Open year round. 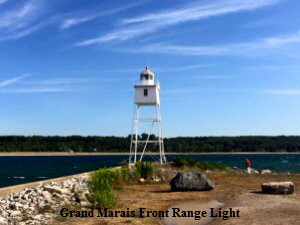 Grand Marais Harbor Range Light, Coastline, Grand Marais, MI 49839, Phone: (906) 494-2381. 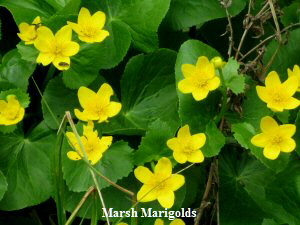 Located in Alger County at the outer end of pier. Lighthouse is on private property so viewing is from water only. The Grand Marais Historic Society operates the Lighthouse Keepers House and Museum. 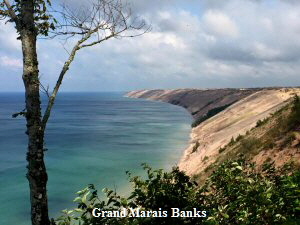 Grand Sable Banks and Dunes [Natural Attractions], Pictured Rocks National Lakeshore. Five mile stretch of 275-foot banks rising from Lake Superior. Topped by 85-foot high Grand Sable Dunes covering five-square mile area. 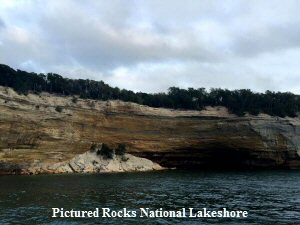 Pictured Rocks and Miners Castle, Pictured Rocks National Lakeshore. 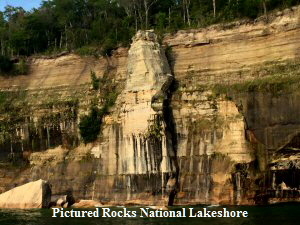 Colorful water carved cliffs rising 50 to 200 feet from Lake Superior. 15-mile stretch northeast from Munising. 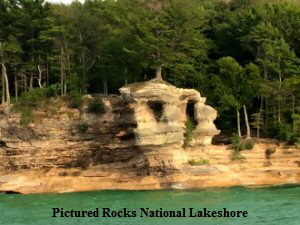 Includes Miners Castle, a nine-story sandstone pinnacle. 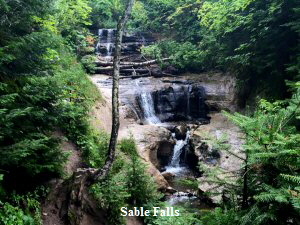 Sable Falls [Warterfalls], Sable River, Grand Marais. Blind Sucker No. 2 State Forest Campground, Newberry Field Office. Phone Number: (906) 293-3293. Luce County - 33 miles NW of Newberry via M-123 and Co Road 407. Phone number indicated above is for the Management Unit. Sites available on a first-come, first-serve basis. No reservations. 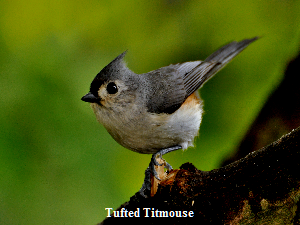 32 sites for tent and small trailer use. Rustic campground includes vault toilets and potable water from well hand pump. Pine Stump (5 miles East) and Grand Marais (16 miles West).